Betterment's investment services first came on my radar a couple of years ago. I invested $1,000 with the company as one of my investment experiments for the first Grow Your Dough Throwdown in January 2014. Later that year, I became an affiliate for the firm (gaining the opportunity for sales commissions on new accounts) and became a contributor to the firm's online magazine. There are many similarities among robo-advisory services. 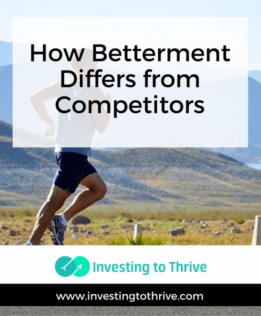 But here are five ways that Betterment differs from similar advisory services. I can invest any amount. Many robo advisors require a minimum investment of $5,000. Betterment has no minimum. There is a simple AUM pricing structure. Betterment recently changed its pricing structure to 0.25% per year of assets under management (AUM), up to $5,000 annually, unless you opt for financial planning services. So, if you have an account with an average balance of $10,000, you'll pay $25 for Betterment's services each year ($10,000 x 0.25% = $25). Many advisors charge a standard percentage whether you hold $10,000 or $500,000. Note that some advisors with higher investment minimums offer services for free, such as the new Schwab Intelligent Portfolios. Recently, the company has introduced planning services that are available to clients with $100,000 or more in a Betterment account. This service is now called Premium. It's available at a cost of 0.40% AUM and includes unlimited phone calls with a team of CFPs. I can invest based on goals. One of my favorite things about Betterment is its emphasis on goals, and its alignment of investment portfolios with goals. So, instead of saving and investing for a house down payment, new car, epic vacation, and more in one account with other advisors, you can save and invest for specific purposes using distinct portfolios, each with a unique time horizon with Betterment. The goal-setting feature can be useful, depending on how I set up the goal. If my goal includes a targeted amount (e.g., $30,000) within a certain time frame (e.g., 10 years), I can see at a glance whether you are on track to reach this goal: if yes, great! ; if not, then I can adjust your automatic contributions, make a one-time contribution, extend my timeline, etc. Though the projections are estimates based on historical information, I can still get an idea of what actions to take to potentially improve my outcomes. All of my money is invested. Betterment has the capability of purchasing partial shares for its clients. So, the entire amount deposited with the firm is invested. Some advisors hold cash because 1) there is money left over from purchases of full shares or 2) they want to have access to cash for AUM fee payments. I can tweak the asset allocations. Robo advisors develop model portfolios that are appropriate for certain time horizons and risk tolerance levels. These portfolios typically contain ETFs representing U.S. equities, international equities, U.S. bonds, international bonds, etc. Asset allocations are often weighted more heavily toward equities for those with higher risk tolerance and longer time horizons, and toward bonds for those with lower risk tolerance and shorter time horizons. Though clients may be able to adjust their time horizons and risk tolerance, they usually are not allowed to tweak the portfolio presented as the best for their situation. Betterment allows me to adopt a more aggressive or more conservative approach as desired. I have enjoyed learning about robo-advisors and think that these services can make investing accessible to a wider range of people. Betterment's low entry point in particular makes it accessible to the beginning investor.